(from CNBC) – Google representatives attended White House meetings more than once a week, on average, from the beginning of Obama’s presidency through October 2015. Nearly 250 people have shuttled from government service to Google employment or vice versa over the course of his administration. In a town where proximity to power is a measure of clout, Google’s ties with the Obama administration in Washington, D.C., are unrivaled among its tech and telecom peers. At least in sheer quantity. Johanna Shelton, Google’s head of public policy, has met with White House officials 128 times over the course of the Obama administration* — more visits than the telecom and cable industry combined, according to the nonpartisan watchdog group Campaign for Accountability. Ms. Shelton visited with White House representatives nearly twice as often as the next most frequent visitor, Alissa Fox of Blue Cross/Blue Shield, who met with White House officials 75 times, the group found. The information was released as part of the watchdog group’s Google Transparency Project, which is intended to shed light on how the giant corporation influences government officials and public policy. The Campaign for Accountability says its has spent a year collecting and interpreting thousands of pages of public records and online documents to create this database. The nonprofit declined to share its funding source. Google declined to comment, but the company did point us to an official blog post from a year ago addressing similar critiques from News Corp Chairman Rupert Murdoch. The post, …written by former policy chief Rachel Whetstone, noted that Google’s visits to the White House addressed a wide range of issues, including patent reform, self-driving cars and technical assistance with the Healthcare .gov website. An administration spokesperson said the White House regularly meets with members of the tech sector. “On a daily basis, the administration engages with a broad range of public and private sector experts to better serve the American people,” a rep said. *U.S. Chief Technology Officer Megan Smith is a former Google executive and the longtime spouse of Re/code Executive Editor Kara Swisher, from whom she is now separated. — By Dawn Chmielewski, Re/code .net. Mark Bergen contributed to this report. 2. How many times has Google’s head of public policy, Johanna Shelton, met with Obama administration officials at the White House? 3. What information was compiled by the watchdog group Campaign for Accountability? 4. How did Google respond to a request for a response? 5. How did the Obama administration respond to questions about this revelation? 6. Read the “Background” below. A Public Citizen review found that of 102 lobbyists Google hired or retained in 2014, 81 previously held government jobs. “Meanwhile, a steady stream of Google employees has been appointed to high-ranking government jobs – an indication of the company’s growing influence in national affairs.” Do you think the amount of access Google has to the President is a problem? Explain your answer. 7. Do you think the act of lobbying Congress or the White House helps, harms, or has no effect on our country? Explain your answer. Read about Google lobbyist Johanna Shelton‘s access to the White House. Over the past decade, Google has transformed itself from the dominant Internet search engine into a global business empire that touches on almost every facet of people’s lives – often without their knowledge or consent. The company has scanned millions of books, photographed homes and streets around the world and surreptitiously gathered information from unprotected Wi-Fi networks. It scans the content of people’s emails, tracks their activities online and their movements in the real world. It analyzes their search queries and behavior in ways many find troubling. At the same time, the company has assiduously courted Washington. 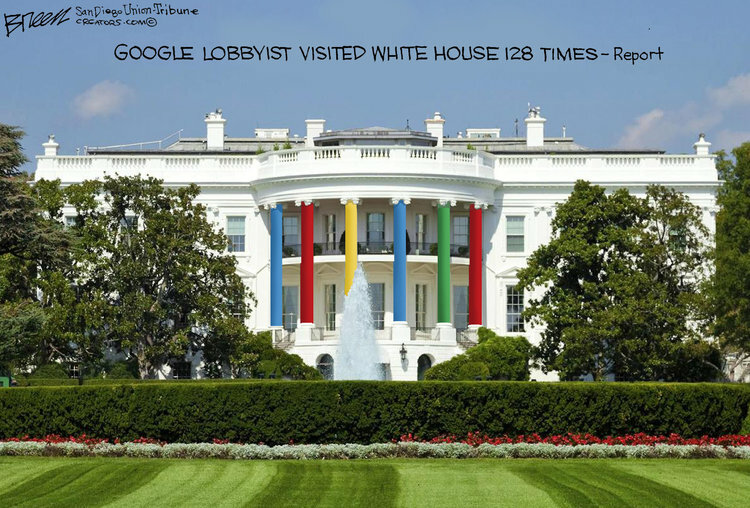 In 2015, Google spent more than $16.6 million on lobbyists – more than any other technology company – and its lobbyists regularly meet with senior White House and agency officials to press the company’s agenda. For instance, the company doesn’t disclose how much it pays outside groups to promote its favored policies and business interests. It was ranked in the second-lowest scoring tier for political disclosure and accountability in a survey of the 500 largest US companies by an independent, non-partisan group. It also scored near the bottom of an international ranking of corporate transparency. Google has acknowledged the gap between its talk of transparency and its actions, but so far it has done little to make its dealings with government more visible to the public. A report [in November 2015] by the advocacy group Public Citizen, warned that Google, which recently moved into a Washington office as big as the White House, is “amassing greater political power than ever.” Over the first three quarters of 2014, it said, Google ranked first among all corporations in lobbying spending, and is set to invest $18.2 million on federal lobbying this year – even ahead of PhRMA, the powerful trade association of the pharmaceutical industry. It also said Google funds about 140 trade associations and other nonprofit organizations across the ideological spectrum – including some working in issue areas relevant to Google’s practices on privacy, political spending, antitrust and more. In 2012, the US Federal Trade Commission looked set to investigate Google under antitrust laws. But the case, centering on whether Google abuses its advantage in internet search by manipulating results to favor its own products, was dropped, fueling theories about the company’s hold over politicians. Google’s reach extends beyond Capitol Hill to the White House itself. As a presidential candidate in 2008, Barack Obama visited its headquarters in Silicon Valley and told staff: “What we share is a belief in changing the world from the bottom up.” In 2012, Google’s executive chairman, Eric Schmidt, a long-time supporter, helped the technology side of Obama’s campaign and spent election night in its “boiler room” in Chicago. Individuals have moved between Google and the White House. 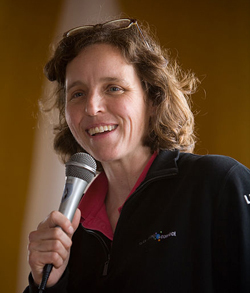 Megan Smith, named by Obama as Chief Technology Officer last year, is a former Google vice-president. In April Hillary Clinton hired Stephanie Hannon, Google’s director of product management for civic innovation and social impact, to oversee her presidential campaign’s technology development.